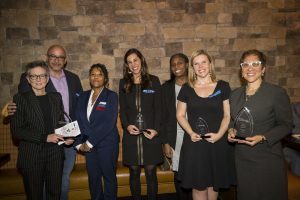 Last month, I was in a crowded reception room filled with 300 of Philadelphia’s visionaries, activists, and funders. It was a lively and friendly gathering. Lots of passionate voices discussing everything from the accomplishments of the new district attorney, to a start up incubator lab for social entrepreneurs, to the great hors d’oeuvres. Before the evening was over, I would be called to the podium to receive the Social Innovation Silver Award for Anti-Violence. I’m moved and appreciative. It also led me to reflect more on how you define social innovation and how to you identify social innovators? Among all the good work happening in the city, how to you choose what is truly new and visionary and how do you determine what might have the potential to create social change? 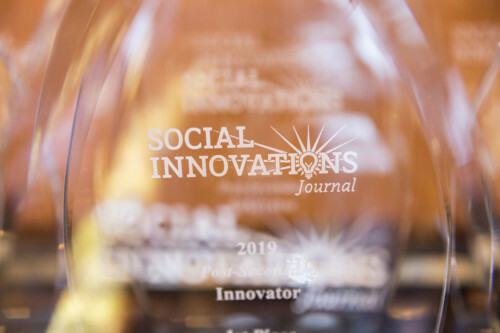 While I don’t have a list of criteria from SIJ for how they chose their recipients I did reflect on what goes into work that has that potential to be a culture hack, a positive disruptor of negative trends, a goodwill force that sets a current in motion and brings inspiration and transformation to a culture. I began to think about the social aspect as well as the ingredients for innovation. Here are three factors I believe social innovators work with—consciously or unconsciously—which makes their work greater than the sum of the parts. It turns a good project into momentum that transforms the world for the benefit of us all. We are social organisms. Human beings live in relationship with each other and our surroundings. We gather in families, neighborhoods and cities. How we work affects one another. A social innovator keeps a finger on the pulse of that relatedness, like a doctor feeling for subtle hints at what creates strength, evenness, and health. In whatever program or service they provide, an innovator feels for that balance point and helps shift imbalance. A social innovator creates a sense of ease, inspiration, and connectedness among the people they work with. This sphere of goodness and safety enables people to loosen their guard and take advantage of what is being offered—learning, changing, and healing in the process. Even the most subtle or intimate transformation occurs in a larger context or environment. Social innovators recognize that whether you are working with one individual in an indepth way or with a large group of people, we all affect each other. We are also all affected by our surroundings. Imagine trying to improve the life conditions for a school of fish, without taking into account the quality and temperature of the water they swim in. It is the same with social ventures. Whether we work directly with systemic or environmental factors or not, to create change we must be cognizant of our surroundings and of the broader influences on that environment. Being curious about what influences have shaped an environment allows us to reflect on the people and challenges we work with in very different ways, revealing unanticipated discoveries. Rather than addressing a specific problem from our own (familiar) vantage point, we allow ourselves, metaphorically, to walk around the issue, looking at it from new angles, new perspectives. Letting our minds wander in attentive but unstructured exploration reveals new insights, questions, and revelations about the environment we are working in. Our contemplations can include anything and everything. We can reflect on the history of a neighborhood, how and when it was founded, the urban planning and layout, the way commerce is conducted, the ease of travel, the aesthetics, the greenery, and the human migration patterns. How does race, immigration, employment, religion, incarceration, language, social mobility, or gentrification affect the environment now? What has its social or economic trajectory been over the last 20, 100, 300 years? What is the deeper history, 1,000 years back, 3,000 years ago, 15,000 years? What do we love about it? What are we surprised by? Social innovators choose an inflection point to work on or sometimes that fulcrum point chooses them. These are points where sustained focus and input can result in non-linear improvement, causing a ripple effect in the greater surroundings. A turn of the tide. A rising up of unexpected inspiration, faith, change. Sometimes we don’t realize what that inflection point is. We follow the openings. The mysterious call. Sometimes we find that what seemed like one small project or event or chance encounter turns into an opening big enough for many to walk through. That’s when the magic of social innovation takes over the hard work of culture change. Finding the inflection point is perhaps the mysterious instinct and inner vision of a social innovator. It could be anywhere and almost anything. With the right eyes and inspiration, that sense of the possible can grow into a reality that moves and improves our culture in unexpected and profound ways. I work with teenagers, teaching them how to stress less and find sources of happiness and well-being within themselves. I didn’t really plan on it. In fact, I didn’t really choose adolescents. Circumstances chose them. Or maybe it chose to put us together. As it turns out, teenagers are a cultural inflection point. We all know about peer pressure and often wring our hands about the havoc peer pressure can wreak. That dynamic also works to improve environments. Teens model other teens. Happier, kinder, more thoughtful teens have an impact on their friends, their siblings, and their classmates. Kindness can become a habit. Teens are impulsive, their brains are growing and developing, favoring the exploratory and the new. Teaching teens new ways of seeing can stick. They are looking to discover and trying to figure out what life is all about. New perspectives and tools that help them make better sense of the world around them and that provide solid ground beneath their feet leave a lasting impression. Teens are still at home for the most part still dependent on their families; yet they are also beginning to be part of the adult culture around them. They carry new memes into the home and into the broader culture, providing an invisible bridge and connectivity that has influence across age groups. When I see teens together, sharing the fruits of the ease and well-being, kindness and curiosity that they learn through Inner Strength contextual thinking and mindfulness programs, I see lightening in a bottle. I can’t wait to see what happens as that gets shared with the rest of the world.
. . . What’s your social innovation? When you start to contemplate your passion in light of the people and relatedness, the unique place or environmental factors, and how what you’ve chosen to give your heart to has potential to be a pivot point, do you start to feel more energy stirring? Keep going. We need as many great social innovators as possible. This world can truly become an amazing, miraculous place.